Having yellow teeth can be embarrassing and also harm your self-esteem. It might make you conscious of your teeth whenever you feel the urge to flash your smile. Everyone wants a great smile, but everyone is not lucky enough to have one. Yellow teeth are among the most common cosmetic dental issues, but it is also a problem that can respond to a variety of treatments. The best option for restoring whiteness to a smile can depend on the source and severity of stains involved. At Bondi Dental we know all your treatment options and want to help you present a stunning smile to the world! Teeth can become yellow for many reasons, but here are six of the most common ones. You’re Getting Older. Your teeth can yellow as a natural part of the aging process. This happens as the strong, white protective coating on teeth, known as enamel, erodes over time due to everyday wear and tear on. Tobacco. Tobacco products, from cigarettes and pipe smoke, stain teeth. If you consume these products, your teeth will darken over time. Poor Oral Hygiene. When you do not routinely brush, floss, and rinse your mouth to remove plaque build-up and tartar, this can hasten the discolouration of your teeth. Medications. Certain medications, such as the antibiotics doxycycline, can darken the teeth of young children. Some antihistamines, drugs for high blood pressure and antipsychotic medications can also stain adult teeth. Go over any such potential side effects of the medications you are currently, or may start taking, with your physician. Illness. A less common cause of tooth discolouration can be either a disease that affects enamel, or the treatment of a disease, such as chemotherapy and/or radiation used to treat cancer. Unfortunate Genetics. It also may be possible that you inherited enamel that is more yellow than that of other people whose genes differ. Food and Drinks. The foods we eat play an important role in how white our teeth are. A steady diet that is high in sugar and starches, without proper dental hygiene, can cause bacteria fermentation that leads to enamel erosion. Foods that contain high levels of tannin, such as wine, tea and coffee, and dark foods such as blueberries and curry spices can stain teeth, while foods and beverages that are acidic can wear the enamel, causing the yellowish color of the dentin to show through. Although we can try our best to control the yellowing of our teeth by simple methods, sometimes it’s just not possible and we have to look towards more advanced methods. Brushing after consuming color imparting agents like coffee, tea, soda etc. Using whitening toothpaste and chewing sugarless whitening gums. 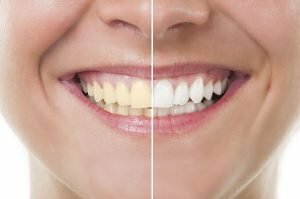 Using whitening strips or paint on bleach. This is simple to use and very cost effective. We take impressions of your teeth, then make molds and custom-fitted trays which will be used to hold tooth bleaching gel in your mouth. You have to soak your teeth in the bleaching gel for about two hours per day. The results will be seen in one to two weeks and you can control the degree of “whiteness” that you desire. This procedure is carried out by our dental professional at the dental clinic using a LED lamp light in teeth bleaching. The process takes 1-2 hours depending on the degree of ‘whiteness’ that you want to achieve. This is by far the fastest and most effective way of teeth whitening. uses top quality LED lamp and teeth whitening gel, which are guaranteed safe and effective. Gum protection and gel are also used to minimize sensitivity during and after the procedure. Results are spectacular! Other treatments are also available, including veneers to cover dingy teeth. If you want a brilliant white smile, call on (02) 9365 7187 or book your appointment online TODAY!